Auguste Marie François Beernaert (1829-1912), Prime Minister of Belgium. Sitter in 3 portraits. Sir John Henniker Heaton, 1st Bt (1848-1914), Politician and postal reformer. Sitter in 32 portraits. Sir (Charles Edward) Howard Vincent (1849-1908), Politician and first Director of Criminal Investigation at Scotland Yard. Sitter in 7 portraits. Sir (John) Benjamin Stone (1838-1914), Politician and photographer. Artist associated with 1436 portraits, Sitter in 28 portraits. 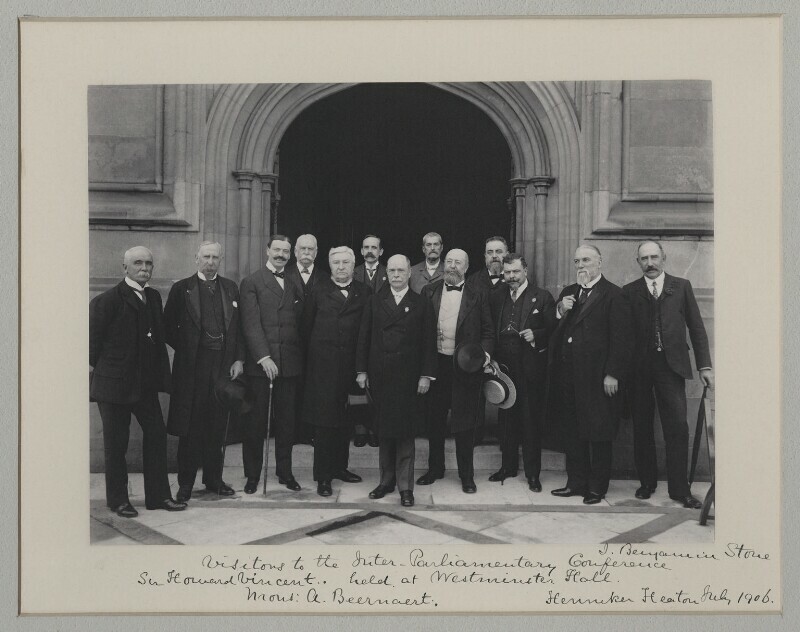 The Liberals, led by Henry Campbell-Bannerman under a promise of reform, win a landslide victory in the general election. Electors vote to end two decades dominated by Conservative rule, with disaffection mounting over the conflict in South Africa and party division over education and tariff reform. The LRC continue to grow as a political force, winning 29 seats and changing their name later this year to the Labour Party. Ralph Vaughan Williams edits The English Hymnal, a collection of the best in English-language hymns. Published by the Church of England, it became one of the most popular and influential hymn books in the world. Antoni Gaudí completes his rebuilding of the Casa Batllo in Barcelona. Known locally as the 'casa dels ossos', or 'House of Bones', the building is striking for its use of curved stonework, oval windows and intricate tracery. San Francisco is devastated by an earthquake, measuring 7.8 on the Richter scale, leading to the greatest loss of life from a natural disaster in Californian history. The impact itself and resulting fire lead to the death of over 3,000 people, and over half of the city's 400,000 population were left homeless. Although still a major city, the earthquake directs trade, industry and population south to Los Angeles.